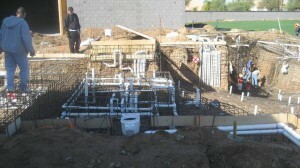 Plumbing requires experience & organization to keep pipes organized and waterflow maximized! You have got to love that huge hole in your yard. As mentioned before, excavation is messy, but has it finally ‘sunk in’ that you are on your way to a new UNIQUE pool as you watch the process begin to ramp up. The next step, plumbing, is probably the most exciting for the owner, Chris, who loves to do some crazy things with pipes, water features, and his custom infloor cleaning systems. If you have not included an infloor cleaning system in your design, then this is your last opportunity to change your mind and add this great feature to your pool. Careful installation of our UNIQUE plumbing is done by our experienced plumbing crew. All of our jobs are pre-planned with a hydraulic design which is specific to your pool, contract and design. There are many different ways to install plumbing in your pool, but we choose to oversize pipes, play it safe, and plan for future enhancements. “PLUMBING” – BRIEF OVERVIEW: After the pool is excavated, we immediately begin to work on the plumbing and equipment set. This involves hundreds of feet of PVC pipe. 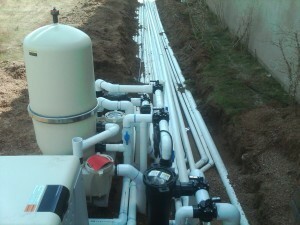 This pipe is all Schedule 40 white PVC pipe which is standard within the pool industry. You should see many pipes going on the floor of the pool for an infloor cleaning system as well as many going back to the pool equipment. The pool equipment, such as pumps, heaters, filters, and electrical systems, should have been dropped off already or it is on the way by now. Please leave all of this equipment outside for our crews, but if you happen to notice it in an UNSECURE area, please contact us immediately so that we can make arrangements to get it secured. The plumbing phase of the job can take anywhere from 1 to 3 days, and usually involves 2 to 3 guys. Also, do not be surprised to see the steel guys show up during the plumbing phase as this is just our way of staying well informed about the progress of your project. I’m extremely worried about the pool plumbing and leaks under my pool – should I be? We cannot prevent you from being worried, but we have never had a leak under the pool shell in the decade plus that we have been building pools. Our plumbers actually pump water into all the pipes prior to completing the plumbing to verify that there are no leaks before moving to the next step in the construction process. This test is actually required by each city for our inspections. Rest assured that there are many sets of eyes on the job protecting you from leaks under the pool. I hate the location of my pool equipment! Will you move it? The equipment location has been specified on the plans by the pool designer, and is part of our pricing and construction agreement. With that being said, it does cost money to move the equipment to another location, and could result in longer electrical, gas or plumbing runs. It may also require re-design of the pool and in-floor engineering as well. There are steps that can be taken to hide this equipment, such as pool equipment walls, large waterfalls or plantings and shrubs. Keep these options in mind before electing to pay for the pool equipment to be relocated. Infloor vs. Vac – did I make the right decision? We truly believe that our in-floor systems is the best system available. There are many reasons why we believe in this system, but there are other ways to clean your pool. The old school way has always been the VAC which has its own share of problems. Adding an in-floor system now would cause at least a few days delay, but we’d be happy to accommodate your request because we feel that it will provide you with a greater satisfaction in your pool. It will also reduce the amount of time that you spend on cleaning and maintaining your pool so you will have more free time to enjoy it. The new Intelliflo Pump seems to be talked about a lot, do I have it in my pool? This pump pays for itself in so many ways. It is the best pump available in our professional opinion, and we have a great deal of documentation and literature to prove it. It is an upgrade, and does cost extra money. Refer to your contract to verify the pump that you have purchased. Chances are, we already ordered the pump for your pool but this is another element where we will strive to accommodate you because we want you to have the best pool equipment and best experience possible with your UNIQUE pool. 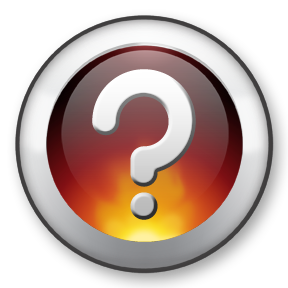 Salt, Ozone, Automation, In-floor – How do I know what I’m getting and what’s right for me? This information should have been explained to you prior to this time, but if it you do not recall the particulars about your pool design, please contact us immediately so that you feel 100% comfortable that you are getting the best system for the money.